Today, I am revisiting a major motion picture that was originally released thirty years ago today. It is a film that was not only deeply moving to watch, but also was a profound religious experience. It is also a film that had many critics, too. 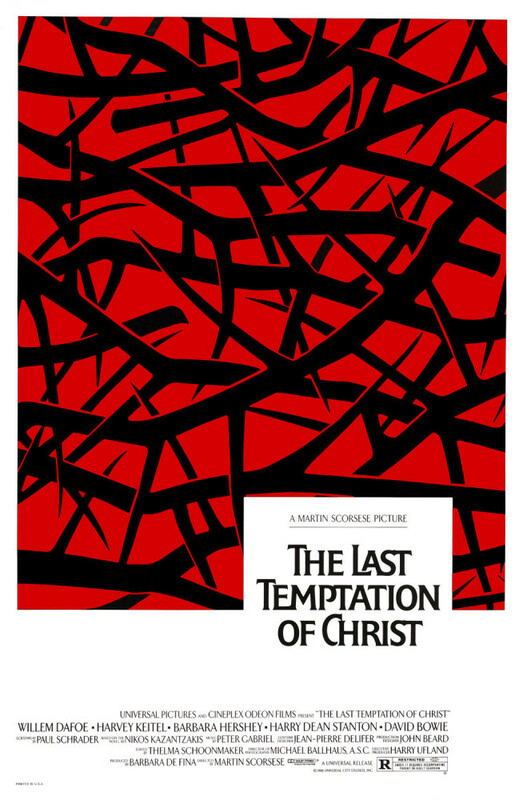 The film is Martin Scorsese's masterpiece, The Last Temptation of Christ, based on the novel by Nikos Kazantzakis, which was first published in 1955 and later in English in 1960.
dig in. Then I remember." first it worked. Then the pain came back. And the voices They call me by name. At first we do not know what this Jesus is making. It is only when he places the piece of wood he was working on, horizontally on two pegs roughly chest level and leans up against it that we realize what it is ... the cross piece for a crucifixion cross. Wait ... he's making what?! He's making what?! It is when Judas suddenly enters where Jesus is working and strongly criticizes what Jesus is doing that Jesus, pleadingly, says that he is struggling. When Judas wants Jesus to join him to rise up against the Romans, Jesus tells him that is not the way the Messiah will come. When Judas asks him how will he pay for his sins -- "a Jew killing Jews" -- Jesus simply answers, "With my life. That's all I have." And so, the stage is set. Not exactly the stuff of the Gospels. -- has always been a deep inscrutable mystery to me." The other point is that Jesus' nature, in Christian teachings, was both fully human and fully divine. Not fully human only. Not fully divine only. Not either nature with a majority. Kazantzakis' novel and Scorsese's film simply give more emphasis -- not sole emphasis, simply more emphasis -- on Jesus' human nature. Most depictions of Jesus in film do not give as much attention to Jesus' human nature. Here, with more emphasis on Jesus' human side, we can see the struggle the man, the human being had with what he was being called to do. At no point in the film does Dafoe's Jesus say God isn't real or God isn't his father. Rather, it shows someone who believes in God -- even posing the question "You can't cast out God, can you?" -- being called to do something frightening and seemingly insurmountable. If any of us were asked to do what Jesus did, would we all simply charge ahead, never questioning, never doubting ourselves (or even God)? For those who theologically are not able to accept a Jesus who doubts and questions God, Jesus' exhortation on the cross -- "Father, why have you forsaken me?" -- shows, even at the end, his human nature remained intact. There are points throughout the film that many religious individuals will be unable to accept. My point, as one voice regarding the film, is not to criticize you and neither is it the point of the film or the novel. While controversial, the film's idea is that the journey is just as important as the destination. You may not want to "go there", but I would offer that religious teachings about Jesus aren't only about his crucifixion, either. There are many things about which Christians have complained about in the film (and no doubt there will be more), so I will start right off looking at them. Please keep in mind, this is not a complete list of what Christians have complained about in the film. At one point, Jesus says -- and no, this is not in the Gospels -- "God loves me. I know he does. I want him to stop." He says this because the physical pain he feels is too much for him, not because he is a non-believer or a prodigy of Satan. He simply wants his pain to end. A possible relationship between Jesus and Mary Magdalene is suggested early in the film. When Jesus visits her at her place of business and speaks with her, Mary condemns both Jesus and God, saying, "He took you away from me." Jesus tells her to blame him, not God. Jesus having any kind of romantic involvement with anyone, let alone a prostitute, has been rejected countless times. For me, Jesus having any romantic relationship is irrelevant, for what does his being in a relationship do to his message? My answer remains to this day: nothing. During his journey out into the desert, he tells a villager he has sins. The villager replies everyone does. Even though Jesus says he doesn't fight, steal, or kill, he does say that he is a liar and a hypocrite. This is another huge sticking point because, in Christian teachings, Jesus was without sin. How can this be so? He says it with a straight face, but is he saying that to convince the villager or to convince himself? Lastly, he tells the villager that Lucifer is inside of him, telling him he's the son of God. Here, Jesus shows his unwillingness to accept his destiny. And yet, it is this villager who is the first person in the film to recognize that Jesus is chosen by God. The film slowly unfolds the ministry of Jesus and just before it, going from rebelling to simple confusion to acceptance. A visual parallel is a montage showing Jesus walking with his followers, with the number of people with him growing and growing. That unfolding represents what any human being would go through to fulfill such a destiny. We see Jesus in the desert being tempted three times, and at the end of the third temptation, the devil says they will meet again, and they do ... and it's a whopper. Suddenly, there is no sound. Jesus sees a young girl looking up at him. She tells him she is an angel and that he is not the Messiah after all. She takes him down from the cross and shows him a new path. Jesus gets married to Mary Magdalene (further suggesting they were involved once). Magdalene dies and the angel tells Jesus that God killed her. The angel focuses Jesus' attention to Lazarus' sister, Mary, and they start a family together. In what might seem like a science fiction sequence about alternate or parallel timelines, we see an older Jesus walking home with his family when he hears someone preaching. The one preaching is Paul (formerly Saul). He preaches the story of Jesus as how it would be recorded in the Gospels. Jesus confronts him and calls him a liar, saying he didn't die on the cross. Paul reiterates that the Jesus about whom he is preaching did die on the cross. We then see Jesus, now much, much older. He is startled by people screaming that Jerusalem is on fire, just as he predicted, and the Romans are killing everyone. The scene switches to Jesus lying on his death bed. He is visited by a few of his disciples, including Judas, who is extremely upset with him since he and the disciples did what they were supposed to do, but Jesus did not. Once Jesus realizes what has happened, without hesitating, he crawls outside, looks up, begs for forgiveness from God. However, time is of the essence, since dying as a mere man simply from old age would deny God's salvation. He pleads with God and is returned to the cross. Let me reiterate my belief that a married Jesus with a family takes nothing away from his message. The key factor here is that, when offered a life without the struggle he had with God, Jesus accepted, but when shown that the life as merely a man has been a lie, he immediately embraces what was his destiny all along. That is a powerful message. Seeing a more human Jesus in this film, as opposed to other celluloid depictions of him, made him more real for me. Instead of his humanity being portrayed as a coincidence -- no denial of his walking, talking, preaching, and dying intended -- his humanity being portrayed as equally important makes his death on the cross even sadder and more relatable. If the Son of God lived as a man among us and felt things as we do, such as fear, anger, confusion -- none of which are sins, thus keeping his lived-without-sin existence intact -- then the depiction of Jesus in this film enriches the nature of Jesus as both fully human and fully divine. There are those who will never see the film because of their religious beliefs. Those who have, or will, see it may not like it either as a film or on religious grounds. I respect both opinions and my goal is not to label you as "wrong". My point is also not to have the film and/or the novel replace the Bible. (I doubt that was the intention of Martin Scorsese or Nikos Kazantzakis, either.) My point is that this film is, or perhaps can be, a deeply moving experience, and, although controversial, does not thumb its nose at the biblical texts. It is, as Kazantzakis states, a "fictional exploration of the eternal spiritual conflict". I'm sure that any questions about whether or not I would recommend seeing it have been answered. 'The Last Temptation of Christ' is a film that you will not just remember, but one that will remain with you long after you see it ... maybe even thirty years afterward.